Last August 2012 I went on my very first overseas trip to another country. I made it to the shores of Saigon aboard Cebu Pacific and upon the invitation of my very good sister from another mother – friend K. I safely made it in and out of that beautiful country in a week. The trip was eye-opening and just added more for my fuel to travel and travel more. When I had the chance to go somewhere to check out some merchandise, what grabbed my attention the most was the fact that at almost every street corner I could see mini café houses just at the side streets with small plastic chairs and tables and some recliners. From what friend K told me, drinking coffee is one of their favorite pastimes. 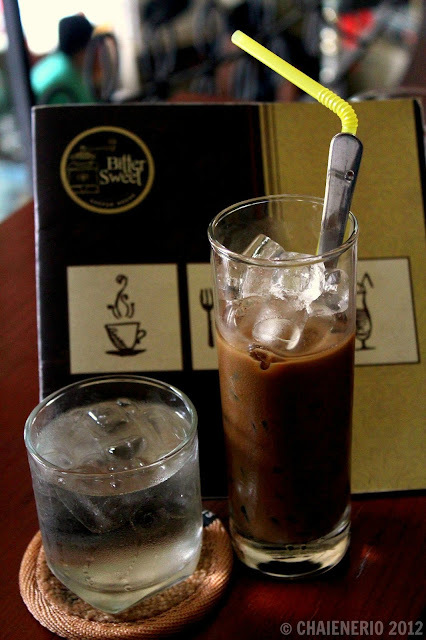 The most famous coffee product that they patronize is I guess the Ca Phe Sua Da (Vietnamese Iced Brown Coffee) which is a combo of Vietnamese-grown dark roast coffee individually brewed using a small French drip filter, ice and condensed milk. There is no water so this coffee is strong and sweet but I think this is their most favorite one. They have it all the time. I had it all the time I was there. I liked it but I preferred to wait a while so the water from the melting ice had thinned out the silky sweetness of the milk so it ended out not too overpoweringly sweet. 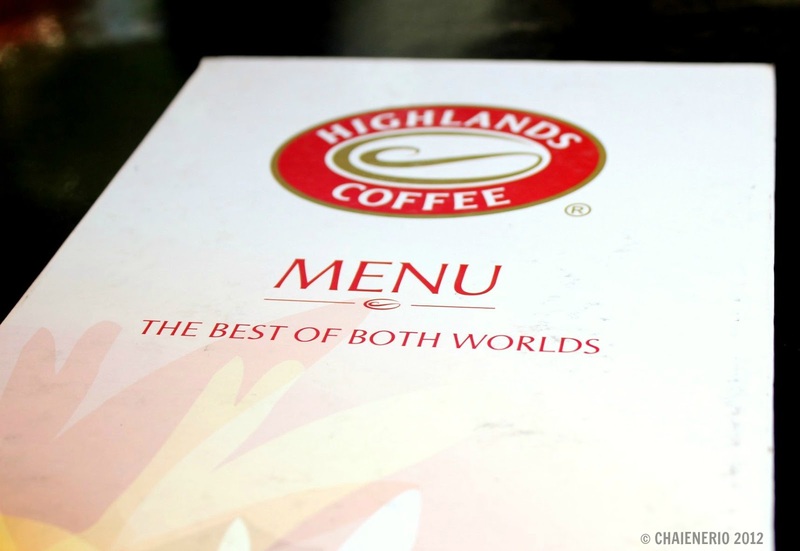 The brand that I think dominates their market is Highlands Coffee. It was like seeing Starbucks in every street corner in Makati. In Vietnam, I saw Highlands Coffee. My first taste of Vietnamese was during my first night there. 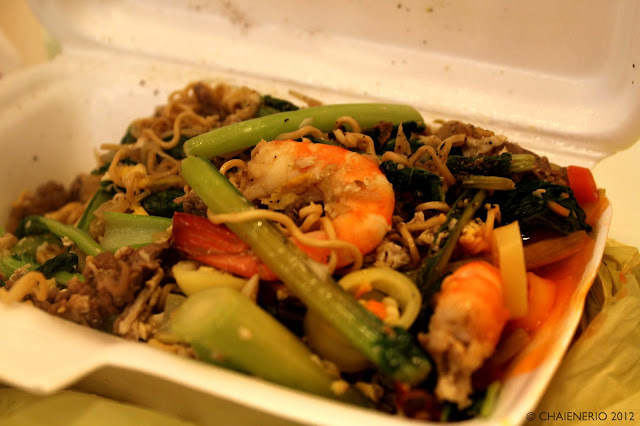 I had made a Vietnamese friend courtesy of friend K and my new friend saw fit to establish our new friendship by gifting me with some local Vietnamese street food fare – mixed sauteed noodles with generous portions of seafood and meat. It came from one of their favorite street stalls in one of the city districts and when I tried it out I wished that we had something like this back home. Available until midnight, the crispy fresh noodle sauteed with an array of herbs together with some shrimps and pork and sprinkled with sesame seeds and garnished with some fresh greens, this filling and spicy noodle dish is a meal in itself and it was a great introduction to Vietnamese food. The very next day I went to friend K’s office and while waiting for her I went out to lunch by myself at a very familiar place – PHO 24 (which is also here in Manila). I decided to have some traditional Vietnamese Pho Bo which they called Pho Bo Tai, Gau, Sach, Bap Chin which had all the trimmings like fat brisket, tripe, muscle, and well done brisket as well as ordered myself a whole plateful of Vietnamese appetizers that included my all-time favorite Goi Cuon (which are the fresh spring rolls). Pho Bo for those who are not familiar is a Vietnamese soup dish which has rice noodles, a choice of chicken or beef broth, meat, and herbs. I tried the Pho 24 here in Manila and it is different from the Pho 24 in Ho Chi Minh. It tastes so much better in Vietnam but that is a given I think. The pho was so hearty and filling and made me think of cold weather, soft couches, books, and eating pho for a meal. I had their appetizer sampler plate which had Goi Cuon (fresh spring rolls), Cha Gio (deep fried spring rolls), and some fried meat balls served together with Nuoc Nam (Vietnamese sweet vinegar which I love) and the soy bean paste dip. 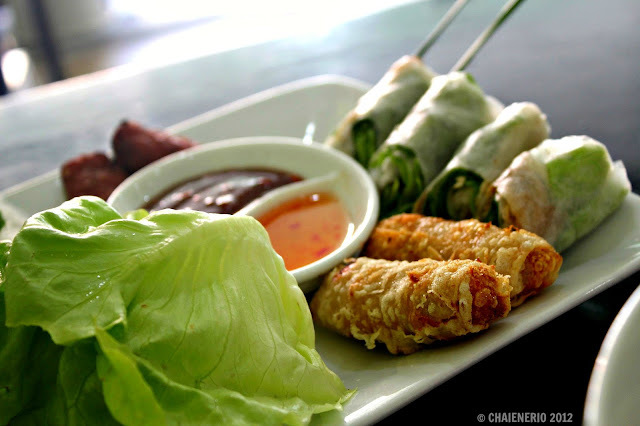 I love the fresh spring rolls and they are always a winner for me. Strips of pork lined together with some rice vermicelli, carrots and a plump shrimp wrapped in a Vietnamese rice paper wrap. Really so good to eat! I could have 10 of them and still want some more. My first take on Vietnamese cuisine was tasting good so far and I couldn't wait for the next meal so please watch out for my next post – Part II. P.S. I found Highlands Coffee here already in the Philippines sold at a GoNuts Doughnut stand in SM Makati.